One of Hong Kong’s most enduring mysteries is finally solved. Why is the Mid-Levels Escalator totally free of the illegally parked cars that infest every other part of Central? The answer, I find this morning, is that it is so rigorously patrolled by traffic wardens. Indeed, so devoted are these heroic and hard-working brownshirts to ensuring that no vehicles obstruct the overhead walkway that, sadly, they have no time to attend to the streets below, which are therefore clogged with trucks reversing into economically unproductive old folk and Mercedes with nasty fat children leering out of the rear window. I approach the two dedicated public servants who are busy keeping the travelator above Lyndhurst Terrace blissfully car-free and ask a question. “Excuse me, kind sirs,” I say. “But did you ever, by any chance, read paragraphs 7.1 to 7.52 of the Director of Audit’s Report Number 23, October 1994, Royal Hong Kong Police Force – The performance of the Traffic Warden Corps?” They look at me with their keen, intelligent eyes. After a few moments’ silence, I conclude that they did not. “Well,” I go on, “it basically said that if you and all your colleagues were gathered together, chopped into little pieces and fed to pigs, no-one would notice the slightest difference.” Needless to say, they find this piece of information both enlightening and highly amusing. What do I do to deserve these things? The Big Boss has come into possession of a pamphlet issued by the Business and Professionals Federation of Hong Kong, the mob of Sir David Akers-Jones’s groupies who fantasize about being mistaken for someone important. 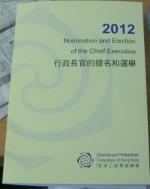 It contains proposals for the election of the Chief Executive in 2012, a subject with which Hong Kong’s thinking demi-monde is increasingly abuzz. Conquered cities that have been accustomed to liberty and the government of their own laws can be held by the conqueror in three different ways. The first is to ruin them; the second, for the conqueror to go and reside there in person; and the third is to allow them to continue to live under their own laws … A city that has been accustomed to free institutions is much easier held by its own citizens than in any other way, if the conqueror desires to preserve it. Looking over what I have just written, I notice I have put the words ‘Sir David Akers-Jones’ and ‘groupies’ in the same sentence. I think I am going to be ill. The main news story today in the Big Lychee is that investment bank Merrill Lynch has not published a research report downgrading three Hong Kong property developers because the city’s air pollution is driving business away. Since that’s not very exciting, our resourceful media folk have excised the word ‘not’ from the story. So now we have it – sell Hong Kong Land, Hysan and Great Eagle because of the air pollution (mentioned in, shall we say, hazy terms in the report’s introduction), not because the analysts believe increased supply of commercial property will put downward pressure on rents. It will become what people who haven’t read Richard Dawkins properly like to call a meme, and the rest of us refer to as an apocryphal story. And a rather good one. More evidence that we are nearing the peak of the economic cycle comes from the Hong Kong Government’s own analysts, who are doing their usual, embarrassing end-of-year revision of forecasts to bring them into line with private-sector counterparts who were right all along. “Did we say 4 to 5 percent?” asks the Acting (badly) Government Economist Helen Chan. “We meant 6.5 percent. Right from the start. Really.” Still, she has a long way to go if she is to get any of her prophecies into her department’s Top 10 Worst Calls. Who can forget, for example, the forecast of 3 to 4 percent expected growth for 2004 that turned out to be 8 percent? Of course, they are civil servants and have therefore had the frontal lobes of their brains modified in the traditional manner. On top of that, they presumably have to align their comments to some extent with the declarations of the visionary Chief Executive of the day. In early 2004, Tung Chee-hwa was still running round in circles, rolling his mad, staring eyes and blabbing about the years of misery and recession that were certain to follow from SARS even if the pestilence didn’t return, which it was almost certain to any minute now. But it’s no excuse. I will respect them when they produce a report recommending that they be fired and the department’s work put out to tender. That might take a while. Today is Thanksgiving for a reason. Few things gladden the heart more than the sight of the odious and slimy idiot savant, Liberal Party boss James Tien, having his reptilian face slapped loudly and repeatedly, in public – and that is exactly what Hong Kong beheld with glee in the Legislative Council yesterday. 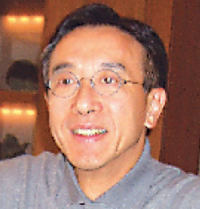 To no-one’s great surprise, Tien’s motion urging the Government to consider building a casino on Lantau Island was criticized from all quarters. As is also to be expected, everyone opposed it for the wrong reasons. In fits of moral righteousness they decried gambling as a sin, sickness and social scourge, as if half our simpletons were not already busy day-trading penny stocks and punting on covered warrants. Betting on horses and soccer is for kids. Tien’s motion was stupid because one casino in Hong Kong (population 7 million) would be a drop in the GDP ocean compared with 20 casinos in Macau (population 450,000 – less than Shatin). It would be economically irrelevant. It was stupid because if Hong Kong legalized casinos it would wipe Macau, which has no other industry, off the map. Did Steve Wynn et al get an assurance from Beijing that the Big Lychee would remain casino-free before he started to put billions into the former Portuguese backwater on the other side of the estuary? I would have. It was stupid because the last thing Hong Kong needs is more tourists. We are up to our ears in them, and there is no evidence the economy as a whole benefits. It was stupid because the second-last thing Hong Kong needs is to cover more of its countryside with concrete. One of the few supporters of Tien’s motion was Abraham Shek, ‘whose real estate and construction constituents stood to benefit from building a complex’. He is a pleasant sort – an occasional donor of Che Guevara books to radical fellow legislator Long Hair. He would never, I presume, support the killing of all children in Hong Kong and the erection of large concrete towers in which to store the remains just because his ‘real estate and construction constituents stood to benefit’. But it would be nice to know where he draws the line. Abraham Razack, as he is also known, is a member of the Alliance, formerly the Breakfast Group – a gaggle of functional constituency representatives who can’t bring themselves to join Tien’s gang. Beijing is currently pressuring them to establish themselves as a full-fledged party that will be loyal to Donald Tsang’s administration in a way the Liberals, in a huff about not being allowed to help form policy, are not. In return, China will pat them on the head – lots and lots – and make Tien green with envy. After sulking like a big cry baby, Tien will come running back asking to be a Friend of Donald again and promising to be a good boy. This is Beijing’s locally based agents’ idea of sure-fire, behind-the-scenes string-pulling. Tien has grudges against Shek for (allegedly) breaking a promise to join the Liberals and for (sort-of maybe) making it look like it was Tien and other Liberals who voted unpatriotically for pro-democrat Emily Lau to become chairman of the Council’s Finance Committee, when it was (supposedly (like we care)) Shek and his Alliance buddies. Shek is a very close friend of pro-democracy legislator and former radio host Albert Cheng, who in turn is quite a good buddy of Donald Tsang. 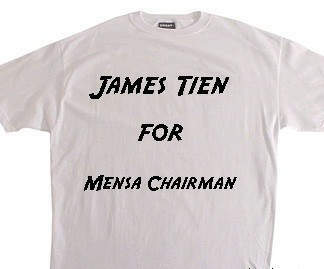 This is all a long, meandering way of saying everyone hates James Tien. On the Mid-Levels Escalator this morning, two British men in T-shirts, shorts and sandals – total strangers – turn to me and ask me what I think about “Ashley Giles replacing Monty Panesar.” They seem genuinely interested in my opinion. One of them mentions something about Australians, and a very small bell goes off very tentatively in my head. Might this be something to do with a change of top personnel at Macquarie Bank? I vaguely indicate that I have heard good things about Giles, and then deftly redirect the subject by saying how interesting it would be if Richard Li told his father and China to get lost and sold PCCW’s assets to whoever he felt like – Macquarie, perhaps!. This confuses the two Brits. It transpires that they were discussing something happening in Brisbane at the moment. A group of antipodean and English men dressed in white are standing around a big field, and occasionally one of them throws a ball, which another one hits with a stick, and then they run around a bit. This will go on for three months and is apparently even more exciting and important than golf. I will declare the weekend open very, very early today.